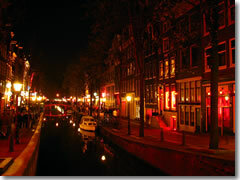 De Wallen, the Red Light District of Amsterdam. (Photo by Rungbachduong. 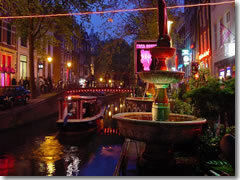 )Dutch pragmatism mixed in with Dutch tolerance has led to the establishment of De Wallen—better known as The Red Light District. It is the best-known—and the safest and cleanest—prostitute zone of any Western city, one that has become one of Amsterdam's major sightseeing attractions for its sheer openness. Amsterdam never presumed to be able to stop the world's oldest profession, so it decided simply to regulate it and confine the licensed brothels to the old city streets surrounding the Oude Kirk, or Old Church (hey, it was closest to the docks). These houses of ill repute display their wares behind plate-glass windows. Yes, the government has recently begun evicting some practitioners of the world's oldest profession from Amsterdam's Old City. Citing the seediness into which parts of Amsterdam has sunk—and the less than savory types it has been attracting (not to mention the crime, including unregulated hookers and their pimps)—the city council has begun shuttering large sections of the Red Light District. They are not, however, closing it entirely, merely reducing its size. The rumors about plans to ban foreigners from smoking cafes, however, are true. The storefronts of some of the prettiest 17th-century homes in Amsterdam are occupied by women half-naked or wrapped in leather, watching TV, darning socks, reading books, and otherwise occupying themselves until a customer comes along (at which point they either close the blinds or abandon the window for the privacy of an inner room). The ladies pay their taxes, and the state ensures that they have regular medical check-ups and health coverage (this didn't stop 60 percent of them from contracting HIV in the days before the spread of the disease was understood). All very civilized, I guess. It's the streets and the clientele who wander them that feel less wholesome. The district is frequented by five types. Three types are harmless: darty-eyed career guys in suits, the age-old sailors, and lots of tourists—giggling, blushing, gawking, considering, or shaking their heads in disbelief. Two other types can be scary and tragic: unlicensed prostitutes strung out on heroin and trolling the streets, and packs of shifty, seedy men who look like they indulge too heavily in both of Amsterdam's famed semi-illicit pleasures. So come prepared to be provoked or saddened by the sight of scantily clad women displayed behind glass, who somehow manage to look both bored and provocative at the same time—and be even more careful and aware than usual for your safety and of your surroundings. Don't take any pictures if you don't want to risk having your Nikon pitched into a canal—these career gals don't want their faces recorded by anyone. 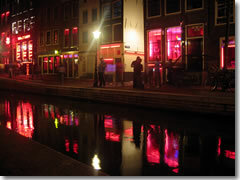 Safety in the Red Light District: I've always felt pretty safe here during the day, but by night I'd either steer clear entirely or stick only to the main streets and leave my valuables at the hotel. The Red Light District fills the streets around the canals Oudezijds Achterburgwal and Oudezijds Voorburgwal. Tram: 4, 9, 16, 24, 25 to Dam Sq., and then duck behind the Grand Hotel Krasnapolsky; Canal Bus: Red, Green, Blue, or Orange (to Central Station).